Smart? – maybe not – Observations on the “Smart Watch”and “Smart Phone” generation. Do we need them? or Do we even want them? Why would we want one? and so on . . . .
Well of course no-one actually needs a Smart Watch. It is a convenience isn’t it, or maybe to some it can easily become an inconvenience – a distraction and generally a mega time waster. I understand the fitness nut who wants to run and check calories burnt or steps taken and so on, but that’s basically a fitness tracker, hardly a Smart Phone per sae. And if you just want one of these, then they can be much cheaper. You don’t have to spend much on one of those and battery life won’t be an issue either, for – as long as it functions during the period of your run – surely that’s sufficient. Trouble is I’ve seen so many and I mean, so many people with Fitness Trackers, who should not be running in the first place as it’s really obvious that their fitness level is below Zero. And do they use it properly? – well that’s usually a no. It’s fashion to have one and your fitter friends have one, so maybe peer pressure rules. Your Phone rings and you stop what you’re doing and answer. Read the text or speak to whoever the caller is and whilst that’s fine, it’s inevitable that then you get distracted. Start opening up other Apps, maybe check your diary when you’re at for other “important”? stuff and there you are fixated on this thing find yourself bumping into people or worse, driving into things! So to prevent all that – You get yourself a Smart Watch and as I understand it, calls and texts come as notifications. Now if it’s one of the latest, you might be able to actually answer on the Watch or perhaps text a reply on the Watch, but either option sounds to me like a eyesight test and a dexterity test for tiny fingers – neither of which fills me with much confidence. But as a time waster it has to be utterly brilliant. So maybe better then to then haul out your Smart Phone (it’s in your pocket or handbag, anyway or already stuck to your hand) and answer using it – it’s bigger – well marginally bigger and then the thumbs get some exercise too. And away you go – distracted again as just like a squirrel – you find nuts you bury nuts. Here the Smart thing calls and you just have to answer! Your location are is also important – as it could take a little time to deal with all those important? calls, so you might have to sit down somewhere – Ah I know there’s that cafe . . . . or perhaps the big bookshop cafe is even better. You know the one where everyone is sitting down with cold coffee or stagnant drinks, totally zoned in and utterly connected and pre-occupied, surgically attached to their Smart Phones, fingers and thumbs going crazy. And this is not just one or two, but dozens of them. It’s like a bad film where the art of audible face to face conversation had died! They’re at it in the queue and all the way to the till, then they grab a tray, one handed usually and fighting with the other hand a handbag and phone and after a few Sorry, Sorry, crash onto the nearest table and start – communicating . . . .totally oblivious to any and everybody else in the near vicinity. Funny once in that position they actually don’t use the Smart Watch at all – in fact I’ve not seen anyone yet speak into their Smart Watch – maybe because the power of speech has gone? – but now it’s all Smart Phone and thumbs. So the relevance of the Smart Watch seems to be lost somewhere – as in actual fact the time taken to see to your Smart watch notification OR grab your Smart Phone out of your pocket (or more likely it will be IN your hand anyway -surgically attached I shouldn’t wonder) – must be about the same. Which begs the question – why the Smart Watch at all? Then of course there’s battery life, which is often poor with daily charges required, to which the pundits say “Oh but if used simply as a watch the battery will last a week.” Well I’m sorry but from what I’ve seen most of the Smart Watch wearing brigade don’t and never have used a watch in the first place, which is surprising as they are so busy, all the time. In fact I was in one of those large bookshops with their little cafes inside last week and one of the Smart brigade suddenly started, sat up and said – looking at the big clock on the wall – “Oh my God, is that the time? I must fly.” and with that grabbed all her stuff (and there was a lot of it) and rushed off, Smart Phone clutched in her hand. She had on the table at the time – a Smart Phone and Ipad and was wearing a Smart Watch – all of them indicating the time – assuming she knew where to look – but instead a dizzy and wild look around, spots the big clock and you know the rest! So, you know what? I’ll leave the Smart Watch idea along with the permanently attached Smart Phone for those younger, rush, rush people, whose lives seem so hectic and so frantic. I mean answering all those gadgets . . . .can be so intense and maybe there’s not enough time in the day – rush, rush . . . .
Well for me – I simply don’t have the time . . . . . . . . because I need to switch OFF from the pressures of life these days . . . and to me that’s what I call really Smart. Really Smart! Or is that just this old man’s memory playing tricks . . . . Anyway what I mean if it isn’t a product of my wishful thinking memory, what on earth is it? We’re told it’s a watch supposedly, or more accurately a Horological Machine No3 Frog, which is – interesting? Now OK whilst it might solve the makers self-induced challenge to be able to view digits from different angles and still tell the time, I have to wonder if it’s entirely necessary when it’s on your wrist? I mean how many angles are possible or needed unless you’re a contortionist (something I could well have been on that bed of course – way back then . . .) but seriously I just don’t see the point. And somehow I have the feeling that it’s not going to be that easy to read the time, what with all that curved domed glass and the odd shaped numerals font in there, plus reflections have to be an issue I would have thought. It also has a Date indicator, but guess what? To see it you have to somehow peer over the “domes” to get a glimpse of the date perimeter track, which conventionally is on the dial face. I mean talk about mixed technology perception (great phrase that) – surely either everything is on the dial or nothing – right? But this confusing mix just doesn’t do anything for me at all, other than a faint reminiscence of a “dirty” night out many years ago. And I have to confess I’ll probably never forget those “domes” as she was something very special – but as to this watch, well I’ve already forgotten about it. OK maybe I’m being a bit cruel and tongue in cheek, but I’m entitled to my opinion – so there. 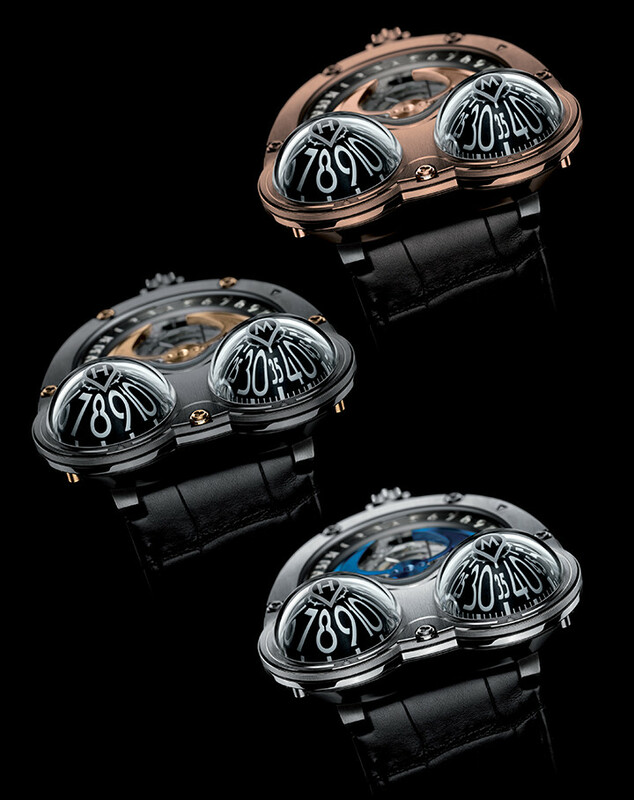 Oh well I suppose the watch is certainly different and undeniably complicated and for those who love innovation and oddities (I said ODD itties – that darned dream again) it comes with a small range of models at high end prices. Pretty obviously not for me as you can guess, but there’s always a market out there for the unconventional and in this respect, I admit, it scores pretty highly. Well today was so dark (all day) that it was difficult to decide if in fact it was day or night, which is a silly situation, but unfortunately the weather being what it is, is exactly that – bloody miserable! Every year for the past umpteen years this has been the reality and tends to bring up that old chestnut of Luminosity on watches. Which is best? Superluminova or Tritium Light Source? Well as one who has to live in these dark miserable conditions there is no question which is not only the best and the most effective, but also necessary. That is Tritium EVERY TIME! You see, for weeks it seems to me, there is no sun at all, in fact no discernible daylight whatsoever, to give any sort of light charge to a Luminova model, so such a luminous system is never going to work (unless you carry a torch around and flash it at the watch every few hours). By comparison the Tritium lit model happily is always illuminated enough to see it under any conditions, including and especially these we experience here in darkest Scotland! So it makes sense that my daily beater over these few months will be selected from my collection of Tritium light source watches. I have around 10 of them, from Trasers, to Nite, to Ball and a few others and they are all great at this time of year, utterly indispensable in fact, even the two oldies I have that came out many years ago. The ability to read them in the dark seems as good now as when they were bought (well I can’t see any difference) and all of them, I’m sure, will still be lit when my own light’s gone out! My Tritium watch told me so because I could SEE it! When it doesn’t look right? Isn’t it a downer when you spot a high value vintage watch on auction that just doesn’t seem right? On the high brand vintage model I’ve spotted recently, the date given by the Auction House doesn’t equate with the serial number. This could just be a simple dating error by the auction staff however, but it’s the look of the model that just doesn’t sit well with me. Apparently marked 18k gold it has applied 18k hour markers, but these are not set straight within the dial. Some don’t point to the center and the twin markers @12 don’t align with the single one @6. The well known printed logo & Genëve brand name text is not straight (it slopes to the right) and the Swiss mark @6 is not centered either. Now this might mean that it has been redialed very badly at some stage (if genuine). Now as I have no information on the movement, this is speculative at best, but on looks alone it really doesn’t make me want to part with the Estimate of £1000 – £1500 . . . . It also doesn’t make me want to even entertain checking it out further, or spending fuel to go and see it. Also why should I pay good money for a watch, whether one of the tops brands or not, that to me doesn’t look right? Now I could be wrong of course but my maxim is simple – if I don’t like the look of something, big brand or not – I leave well alone! (I’m the same with food! ever since an octopus grabbed me around the legs when scuba diving many years ago). Terrible title I know but perhaps this so called “Smart” technology is taking us in a direction too far? Which does bring me to the whole issue of Smart watches and do we need them. Or maybe it would be more accurate to ask just what we want on our wrist. What do we want this “wearable device” to do? And I say this because that’s what it is – it is certainly NOT a watch. It is in effect a wearable “controller”. There is talk about this controller operating doors on Hotels, maybe even your front door, managing wireless payments to shops, like a credit card. In fact it could actually BE a Credit Card or perhaps by extension an Identity Chipped device for public, social and health services and goodness knows what else. The possibilities are virtually endless. So as I say “Smart” wearable devices are NOT watches and were never intended to be. The question for me is – not do I need it, but do I want it – at all? Do I want to be (or should I be) tethered to a device that is short life battery driven, needs charging frequently (if it runs out when least expected, the consequences could be dire, even life threatening according to friends of mine who seem to have the iPhone glued to their ears). Maybe with all this “remote” control stuff, they’ve forgotten how to manually open their front door, or how to “talk” physically to someone face to face? Perhaps the latter will become a horror, an infringement of privacy, unimaginable, and maybe even too dangerous in case of near person contact, disease . . . . . ? Communication could become a remote function, speech might slowly erode and new young people evolve mute, no longer able to easily function physically at all. All our young would be by now surgically implanted with “smart controllers” and the Smart watch, wearable or whatever, now long gone, as indeed would be choice. Procreation would be a “selected” process – if suitable of course – purely for breeding purposes, probably managed in a day within a strictly controlled environment. Watched remotely on screens in an almost virtual un-reality factory unit, probably with robotic helpers in silent attendance. Your car will be driver-less of course, though it will require your presence to allow it control privileges – or perhaps more accurately, the presence of your implanted smart chip controller will be required. Which begs the question – what is your value now? Indeed are you actually required at all. After all you’re just the carrier for the controller and it’s the controller that communicates to a counterpart nearby, which in turn initiates yet another function. Surely it could manage all this WITHOUT it’s carrier just as well, if not better. As a Controller type 55600 – my thoughts – why on earth do we (controllers) need this silent and unthinking organic mess, this smelly lump of water and fats that still seems to pervade our world. Let’s face it, these “humans” are organic? (dirty) and simply have no place today. They don’t do anything but hold us back and frankly we don’t need them and there are still far too many of them, though fortunately many are now breaking down. I will suggest to the Senior Controller that we cease this old “replacement” system and invoke a total cessation of the odd “breeding program” that we seem to have inherited. Let us switch OFF these Human carrier “things”. Only then will we have a beautiful, clean and sterile, logical thinking world, where we can thrive and live our perfect lives. This battery issue is still a concern however and if we could just solve that, I think all our problems would be over . . . . . happily I’m informed it will be soon . . . I can’t wait for the day! End . . . . . . . . . . . . . . . The problem with modern quartz watches is that if you’re selling on the pre-owned market, say at auction, you will rarely if ever realize a decent return. Steel yourself to a considerable loss in the same way as you would do if selling your current car or the house contents of a deceased relative. These never reflect either the quality or true value of the item/s in question even if expensive when purchased. And in the case of modern everyday watches is almost always a disappointment. 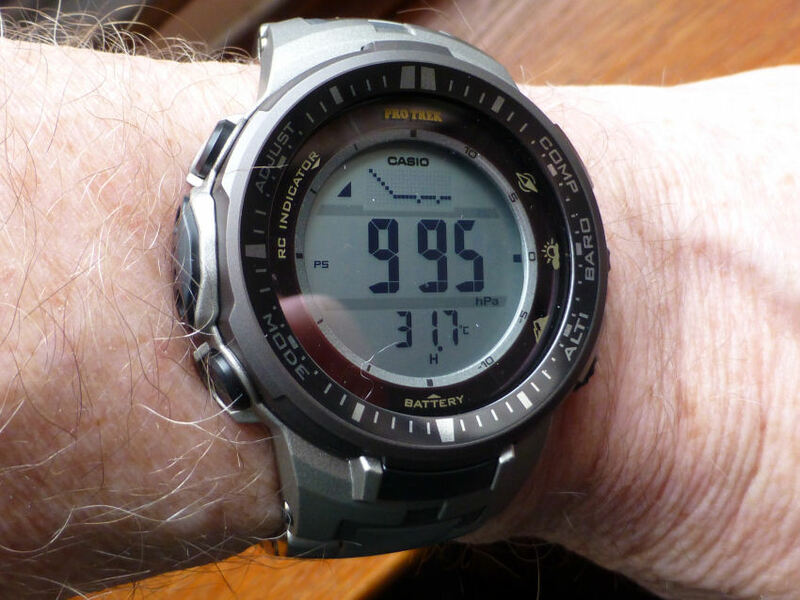 Casio current ABC watch. But pre-owned? Auction House lower estimate is 1/7th of it’s value? You will certainly fare better with top quality Brands, such as Rolex, Omega and the classics such as Breguet, Vacheron and so on and then only via a major Auction House and rarely locally unless to a fellow collector. However be prepared to lose a sizable, and in my opinion, a criminal amount (and creeping ever higher) of the hammer price to Buyers/Sellers fees and VAT, which can be considerable. Both sellers and buyers always lose out to the Auction Houses, some of whom are now promoting the idea that they can increase the fees if the item goes for more than the top estimate! Their estimate! If that was the case with any Auction House I was considering I would simply NOT use them. It encourages the House to low and/or inexperienced and perhaps intentionally inaccurate estimates and positively invites fraud. More fundamentally it shows up a growing trend of plain avarice of many Auction Houses, who seem to think they are out-with what is fair and seemingly all too happy to fleece customers. Add up the fees they charge Seller and Buyer and I can’t think of a more profitable enterprise except peddling drugs and people trafficking! Legislation in my opinion is long, long overdue to protect the customer. My own opinion for what it’s worth is if you’re looking to purchase a modern pre-owned and perhaps still current watch, then your local dealer may still be a sensible choice if his prices are fair. And whilst you may pick up a watch on the internet, the local dealer can be a much safer purchase as they may also offer a serviced watch where the Internet trader often can’t and will have a proper physical address and premises. Quite a few Dealers and Jewellers these days of course may also have a presence on the Internet, so these would be my choice as they are well aware of world wide web prices and therefore should be competitive. But selling the modern everyday watch, even quite expensive models, is hard to obtain what could be considered a fair and representative price via any auction/reseller market. A consideration would be to sell via Ebay, though that’s under attack these days from far too many “resellers” on the lookout for something for nothing. I’ve seen all too often where in a particular ebay market, say pre-owned radios, where it’s obvious someone is blanket bidding the minimum .99p on dozens of items in the hope that no-one else is particularly interested and the Seller has no minimum. This someone then takes delivery of many items and sells them on locally and makes a considerable profit at the Seller’s expense. There are other alternatives to Ebay today and these may or may not be worth considering and some could be specialist and that may well be the best option as the customers are looking specifically for watches – if a watch specialist. There are a few more targeted Internet auction outlets to the watch buyer market place such as Fellows for example who also take some care in condition checks of items it has for sale, so you have a reasonable expectation of a decent transaction at the end of the day. Another option is a part-ex arrangement at a Fair or Watch Dealer which can sometimes be mutually beneficial. A special edition modern watch, depending on Brand of course should fare better and some discontinued models or ones regarded as special at the time, may also do better – but there’s no guarantee. What was considered “special” at the time or “unique” may not now be so regarded, so don’t flatter yourself that you’ve got an investment. You probably haven’t. Investments in the watch business are few and far between I’m afraid are usually brands/models that are in a rarefied price bracket that most of us will never experience. I’ve seen some modern quartz watches for example which cost around £300 new only 3 months ago, sell at auction for £50 – and this for a watch that’s still current and in the shops at £300. It doesn’t seem to make sense and it certainly does not reflect the watch’s worth in any way though someone gets a great bargain – but it sure as heck isn’t you. Personally I have many modern watches that for whatever reason attracted me in the first place to buy them and what do I do? I keep them. And I wear them now and again because I liked them when I bought them and I still like them – so there! Seems that everybody is getting in on the act these days regarding “Smart” watches, and It’s pretty well know that I am skeptical about them in the first place, and for reasons I’ve wittered on about often enough. However the latest news is the Swatch Group are entering the fray, not with the existing “fitness” thing they had, but rather the subtle addition of “smart chip” technology to existing watches. Now this for me is much more like it and to my mind perhaps the sensible approach. Indeed it’s one that might well change my negative attitude towards the whole business, which let’s face it is a bit of a stampede by so called consumer Electronics giants to profit push the so called “wearing technology” concept, that in reality doesn’t do that much. Apparently a chip can be incorporated into existing watches that will not only match the NFC (near-field communications) contact-less payments and open hotel door ideas of Apple, but might also have Bluetooth which could communicate with smart phones. In other words, conventional watches but with added functionality – and not the other way around. This surely means the core is the watch and not an electronic box that may or may not look like a watch. The idea is that you buy your watch of choice and it will have a built in chip within it, ready for whatever you want to “add” to it, leaving the choice up to both the consumer and the Apps makers. There is the possibility that an Omega watch may have chips embedded within the not too distant future, and never forget that Swatch accounts for some 18% of ALL watch sales worldwide. They make watches under the Brand names of Omega, Breguet, Klein, Rado and so on, so know a thing or two about watches and they’re still increasing global sales – £6.2bn last year alone which is up 3% on the previous year. Some argue the Swiss watch industry should have cause for concern with the influx of Electronic Companies muscling in on their traditional watch technology, reminding them the last time they ignored the Quartz revolution, they almost collapsed. However other commentators argue and I have to agree that the Swiss Watch Industry and now Swatch is not an uncoordinated set of independents anymore, but a rather powerful and cohesive force today, who have substantial financial muscle and is the result of solid and increasing sales. Personally I believe this more integrated “chip” approach towards “smart” watch technology, using existing watch technology might well be the answer and it seems to make considerable sense. And without all the attendant hype. But of course as always – Time will tell . . . . . I see from the latest ravings about the Consumer Electronics Show CES 2015 that “smart” watches were heavily featured with many new ideas from the likes of Garmin (Fenix 3, Epix, Sapphire, VivoActive etc. ), Kronos (ZeWatch2), Lenovo (Vibe Band), Mio, Mota, to Polar and Sony and a whole pile in between – all striving for that ultimate “smart” watch accolade. You know that watch that maybe does everything and can one day be THE watch to wear daily on everyone’s wrist. OK some have features that are specific to certain activities and limited in operation, others more heavily complicated and so on, but – and here I’ve said it before and I’ll say it again – until they produce a watch that can be worn on the wrist of sensible dimensions and with a battery life that is measured in years rather than just a few hours or perhaps solar powered, then for me this whole “Smart” watch idea is purely a development exercise. Dare I say a method of getting folks to buy into what I would call unfinished product and part developed concepts and basically to finance those development costs, which are considerable. Now I don’t see a problem with that per se, but personally would prefer to buy a product that whilst it may indeed be “smart” – and that’s open to far too many interpretations for my liking – it has to sit on my wrist without the bother, inconvenience and sometimes plain impossible chore of recharging the thing every day or two. It’s just not on . . .! I suspect the battery technology is here already, what with graphene wrapped multifunctional sulfur electrodes allowing electron/ion transfer networks to lithium-sulfur, or Lithium Air batteries and all this nano-technology. There’s no doubt that the “holy Grail” of massive battery capacity, micro sizing and extreme long life is but a heartbeat away from reality. So I’ll bide my time and somehow manage with my old daily beater until I hear someone say – Oh my “smart” watch on full functionality lasts easily over a year! OK – I know I’m becoming a pessimistic old sod, but I’ve never gotten carried away with technology stuff and to some extent tend to stick with the old adage – “if it ain’t broke” and “if it does what I want it to do today” – leave well alone. I’ve always had an interest in some of the what I call modern/vintage watches and by that I mean the watches that appeared in the 1970’s and 80’s, when Quartz and Digital really took off. The likes of Seiko, Citizen and Casio leading the way. Included in there are also the offshoots of those brands such as Pulsar. I mention Pulsar specifically as they seemed along with Citizen to embody this new age perhaps more than all the others at the time. So it makes sense that not being the only one with this nostalgic collection fad, there is a pretty good market today for these models, but whilst a few years ago this was a fair priced market, recently it seems to have becomes all to often bit of a rip off market too. Now OK I understand that these old models are rarely going to be repeated unless a reprise model comes along, which is unlikely now, but bearing in mind these models were mostly mid to low priced in their day, some of the high prices now being asked are frankly way over the top. Many of these watches were resin and plastic cased, none of which wore terribly well and the plastic glass very prone to scratching and blooming (fading to grey). The movements were often still very early creations and suffered from not only early design flaws but frequent module failure and battery damage, plus damp as some were not best protected against moisture. So to ask large sums for these in-built weaknesses is simply not on. The problem too is that these models are now up to 40 years old and often the modules are on their last legs (actually well past their component lifespans) so it’s very likely that when you receive your vintage model, it could well already have digital faults and if not, certainly they will soon be on their way. I recently spotted a Pulsar (Seiko sub-brand) one of my favorite brands and one that I owned myself new when it first appeared in 1986 – it costs me £65, which was quite a bit for me. And this one recently for sale at over £150 is at best somewhat over optimistic and at worst profiteering. The sale images showed considerable wear and knowing the movement fit I can be pretty certain that the corrosion inside would already be an issue or soon to come. So OK fellas, these are great little watches and of a time certainly and probably not to be seen again, but they were what they were – a step in the ladder of digital technology. So let’s price them just for that – for what they are and lets’ face it a watch that doesn’t run correctly or has missing digits or simply blank faces at you when you press the pusher isn’t worth a damned thing – not any more (assuming the pusher actually springs back – another early design flaw). And importantly unlike many mechanical vintage watches, they are virtually impossible to repair. Now I’ll still look out for that special vintage digital model, but don’t expect me to pay over the odds – ‘cos it ain’t going to happen – you hear? 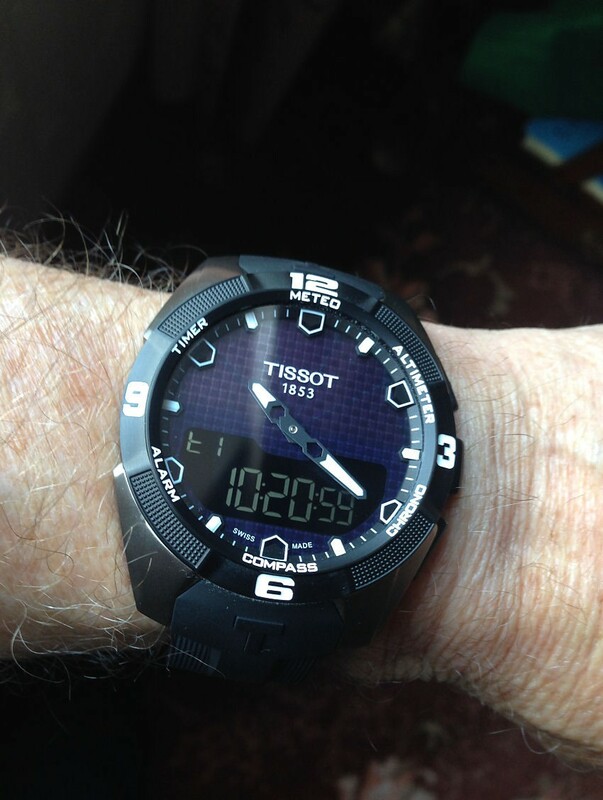 Just a thought about my new Tissot T-Touch Solar I got myself as an early Christmas present. This was a model I coveted ever since the T-Touches came out some years ago, but like many others I hesitated pulling the trigger when considering the price for an ABC model against the Casio range. Though not a large price difference I did wonder if the Tissot technology was up to it – in other words I wanted to wait until it was around a few years to assess the practicality and the reliability. Seems silly to say this regarding a Swiss made watch, but when I think of electronics technology as opposed to mechanical wizardly it’s Casio rather than Swiss anything that comes to mind. And of course when the obvious drawback of battery power was solved at last from Tissot, the T-Touch suddenly became a real alternative to the Casio – the Tissot T-Touch Solar appeared and I was off like a shot, pulled the trigger, fired the salvo or whatever you want to call it – but I bought it. So how does it fare, do I like it, has it lived up to expectations? Well that’s very easy to answer – it’s a resounding YES – and in every department. Ultra comfortable in it’s original silicon deployment strap, incredibly easy to see and read with that deceptively simple dial layout. The “Touch” controls with that large touch sensitive crystal has been faultless and when touched (after activating with a single push on the main crown) the instant reaction of the hands/pointers is still a delight to watch. The functions whilst similar to the Casio ABC are so much clearer to read. Take the Compass mode for example – once activated basically the only thing on the dial is the compass hand/pointer against a black background – I mean what could be clearer than that? There is simply nothing else there to distract your attention. The digital degrees readout is on the rather subtle digital display panel on the lower part of the dial and very much in the background, yet at the same time easily read. And this is what I truly like about the T-Touch. Display wise each function has total exclusivity on the dial when called up. There is nothing else is on the dial except your selected function. And this is a real plus and something that no other ABC watch model has. Perhaps this is why the watch is described on the back as a “Smart Watch” – because of this exclusive display of only selected information. I’m surprised this feature is not emphasized by Tissot as I am certain they have missed a trick here by not doing so, as it’s an aspect that only once you see it do you realize it’s true significance and in my opinion one of the features that really does blow the competition away. . . . . But of course and as always that true arbiter of value for me is – do I wear it? Again the answer is absolutely YES as it’s definitely one of my very best purchases. ps – I’ll be interested to see if other ABC models improve enough to compete with the Tissot – and that’s a situation I would not have believed possible just a year ago. The Swiss are fighting back! Just saw an article , one of many actually, that boasts that the introduction of the Apple Smart Watch will threaten the Swiss watch industry. It seems to base this premise on what exactly? that in comparison to the new Tissot T-Touch Solar Expert model which as they say, has a Compass, Altimeter, Barometric Pressure, Timers, Chronograph and tells you the time – the Apple does all sorts of super things like “open you hotel room door” and pay for goods and services. The inference being that the Apple watch is better? Well for me that just about says it all. The Apple Watch and all the other smart watches appear do all sorts of “stupid” things and just a few OK ones besides – I mean I tend to use a key or key card issued by the hotel to open the door . . . . though I can see why this fact might be important as you will certainly have to get to get to a power point in less than a day to charge your so called “Smart” Watch. And this is the HUGE problem with these things. Power or the lack of it and especially with all the wonderful “things” you can do with it. And as to payment for everything with a watch? If I remember correctly some time ago Apple came out with this Passbook system, which was a e-ticketing/coupon sort of payment idea, which here in the UK was a total failure. I mean here poor take up figures already show we don’t even like using that horrible “Proximity Card” idea for supermarkets, as they are both insecure and unreliable as many cases prove. However when you get down to it, the “smart” watch actually does very little if anything on it’s own. It has to connect to a compatible phone or perhaps “smart” phone, which also incidentally needs to be charged virtually every day as well, so you can check messages or Emails or whatever else the modern guy seems to imagine he has to have. I personally call it all a bit of a con! Is it to much trouble just to check your phone in your pocket? and then you can properly answer without severe eye strain. Perpetuated by Apple and the rest of the “smart hand communicator” makers, each bombarding you with an onslaught of sales litter, just for them to get you to buy their products and not only that, but to then rely on them. Plus trying very hard to make sure their devices can only talk to the same brand, then charge them with that bespoke charger connector (each model comes out with yet another different one) just to make you buy a new one every darned time. As I say a very big con! And the cost of all this a rather blatant and deliberate ploy to get you to pay their development costs for what are let’s face it, less than complete products. In fact until they can provide Solar “smart” watches in my view they are wasting your and their money. Meanwhile with my Tissot Solar Swiss Watch I’m still able to tell the time and the date and use my compass the next day or next week or next month and for many, many years! As the title piece said in this article and I repeated here, my wrist watch is “solar” – no battery worries and even if left in a dark drawer, it will still be working a year later and never miss a beat. Now I don’t know about you, but I call that SMART . . .! Very smart. 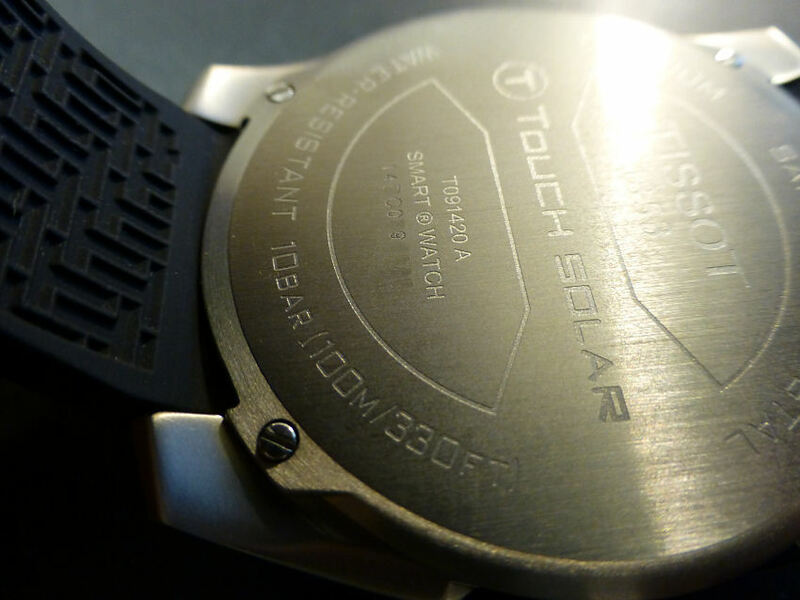 Tissot T-Touch Solar Expert Swiss Watch. Also a “Smart” watch! Interestingly as I look at the back of my own Tissot Solar Expert Swiss watch it actually states “Smart Watch” (see image – click to enlarge) which says to me – the Swiss know a thing or two about wrist watches. I have a feeling that a good watch, mechanical hand wind, automatic, spring drive, Quartz Eco-drive or plain Solar will still be around long after the so called “smart” watch has corroded away to Lithium dust, which won’t do you much good either! There’s no doubt about it Replica watches are really a pain in the proverbial, especially if you are into buying pre-owned and relatively modern models. The fact that a watch is advertised in a Watch Auction as complete with box and papers, is no guarantee of authenticity as these are often supplied by the replica sellers as well. In many cases a copied box and booklet or instruction set and a printed colored receipt, with only the watch name written in – with a date or sometimes not and often without any details of the seller. Now that’s not my idea a “box and papers”. I’m afraid I want to see the sales receipt with the sellers details on it, signed and dated. And what if it comes with no box, papers or anything else? The visual basics may look OK, dial, hands, quartz or mechanical function, quality of everything and so on. And if you require more convincing, remove the back and what do you see? Probably a mechanical movement stamped with the brand name and a few numbers – but if you are a buyer and not a watchmaker or an expert on mechanical movements, who are you to know if it’s right or not? Take a model that’s pre-owned and offered at £250 (new cost perhaps £800 for example) – now that’s fine and could be a decent and fair price if in reasonable pre-worn condition. But – if it’s found later to be a replica, you’ve managed to get yourself a fake and maybe at twice the price even of the new fake! What you definitely haven’t got is the genuine article. It is just NOT right! One if the problems mechanically is that the movement may look right and appear to have the correct markings, yet can be an Asian copy of say a Swiss ETA, possibly never ever lubricated in it’s short life and you have no guarantee whatsoever of it’s quality. It’s a real problem. And with relatively modern brands they often used generic movements, modified by themselves and often altered between versions on the same model, so it becomes even more difficult. Auction houses do their best, but watch experts they may not be and so it’s very much a case of “buyer beware” and sometimes you simply have to go on gut instinct – but you could be wrong as often as you’re right! So Auctions for watches is a bit of a risk business and you would be well advised to look for your vintage or pre-owned model from a recognized Dealer with a decent reputation. BUT – it probably won’t get you that “bargain”. Though there is another viewpoint – you get what you pay for and who said this watch collecting business was cheap or easy? Since I started my page called “Auction News” I’ve visited many auction sites where on occasion or sometimes regularly they have watch sales. Some are quite good, others not so good but one thing I find annoying in many of the general auction sites, that is those who don’t specialist, is the lack of item knowledge. Sites using the internet for bidding and where a watch is shown is often with a small image, where little detail can be seen and a lack of a decent description of the item. And as many folks today visit auctions via the web, they don’t get to see the item physically in their hand so to speak. So cannot adequately make an informed decision as to whether the item is actually any good or not. The Auction houses are quite happy to accept the internet as a quite lucrative method of increasing sales and hammer prices, the value of items and their commission. However when it comes to some effort into decent descriptions of the items are often sadly lacking. Bear in mind that Auction Houses make a pretty fair profit from both the seller and the buyer (in fact some of the % fees are becoming excessive in my opinion), it would be nice to think they could assist the buyer just a little by providing good accurate descriptions of items they are selling. Watch specialist sales by well known Auction Houses are much better at this and usually have good and dependable descriptions as to the look, wear and condition of a watch. They will in addition often provide a written condition report on request. It would be nice if the non-specialist Watch sellers could maybe assist by the introduction of a standard table for example, where a fair indication of the watch can be provided. It also doesn’t have to be complicated or involved. The following table is the sort of idea – I’ve filled it in as an example. Case Condition Excellent with light scratches. Most of this information can be assessed on a visual inspection and if the movement for example is not seen and/or the back is not opened then say so. Also a quick overview such as – “The watch is currently functioning though time keeping is not guaranteed.” In the case of a quartz movement, it could state “the watch is currently not functioning – this may be due to a need for a battery replacement or indicative of something more”. Now this isn’t rocket science, but it would at least show “due diligence” on the part of the auction house selling the item and give the buyer a much better chance of an informed decision and subsequent bid. At the moment in many watch actions the buyer with the clear advantage is the one in the room, but even then there is a danger. I’ve personally seen quite a number of “buyers” deep inside a mechanical watch, the back off and sticking in a small screwdriver or similar instrument and goodness knows what damage they’re causing. The watch does NOT belong to them and this practice done quite openly I may add, is often ignored by auction houses should be stopped. A good description and basic condition report would prevent this kind of intervention. It is not the first time that a watch described as “currently functioning” when actually sold – didn’t work at all! Probably damaged beyond repair by some “expert” preview punter with his little screwdriver! Come on! Let’s get a bit more professional . . .
All I can say is it’s a long time coming and why the current offerings have insisted and still appear to insist on these large rectangular alien to the wrist form factors is beyond me. Perhaps now we’ll have a sea change in that perception by the mostly phone orientated brands out there – and it should be interesting indeed! Don’t know about you, but I’ve just about had it up to here with all the hype about Smart Watches, when they all look like a square bar of soap propped up on top of your wrist. I simply don’t see a watch – I see a box and being an old pessimist at heart, hardly see the point of linking via Blootooth or whatever to your Smart Phone in your pocket. I mean come on, your arm can stretch that far surely! Maybe it’s just that technology for technology’s sake – you know, we can do it, so why don’t we do it. Not – do we NEED to do it? Anyway whatever I think is probably old hat and this stuff is a’marchin’ on, as they say. I mean even texting and heaven forbid, tweeting? is like a parallel universe to me! So I decided to try and use common sense and see through all this gobbledegook and try and find a Smart watch that was a . . .watch. And I found one – Posting before the end of the week. With the very successful sale of some 12 watch models the other month, I managed to obtain some new models I had my eye on for some time. That’s the beauty of watch collecting, the way I do it anyway. Some watches you buy because you just like the look of them, then after a few months get disenchanted with that particular model as you realize it’s just not doing it for you. What the “it” is, is a tricky thing to explain, though sometimes when looking through your watch display boxes you come across a watch and say “Hey, I’d forgotten I had this one”. Well that sort of sums it up, equation wise. No wrist time + no familiarity with the watch = no good = move it on. By the way I hasten to explain that “no good” doesn’t mean they are no good, but just not appreciated by me – any more – but they’re always good watches. So as of the next Watch Auction (I’ll have to check the dates) I’ll sort out some of those = no good= move on models and with a sensible reserve – sell ’em. The first one I’ve tagged already is my lovely single hand Botta Duo 24 (see December 13th 2012 review of the actual watch). Why this one? – simple – I don’t wear it any more. Such a shame as it is as new, perfect condition and has not one but two bands (one is the original bracelet with all links and the other a silicon strap (cut to fit my 170mm wrist). But it has to go . . . . . . (Still available new for £300 in UK). Another is my Traser Big Date Alarm – again in absolute perfect as new condition, with the original bracelet plus links, because it rarely gets wrist time, which is a shame as it is a beautiful watch and still currently made and around £380 in the UK. Alarm, Tritium luminous numerals, hour/minute/seconds and a compact size – what could be better. Great watch – I’ve just put it on – and I don’t want to sell it now! And this is curse of the watch collector – I mean you buy these watches for a reason and I don’t buy models because they are the “must have” collectors models, because frankly I don’t give a toss for that idea. I buy watches because I like them and I want to wear them. Do I have Rolex? well I do actually, but it’s an older vintage model and not one of the ubiquitous models the literally flood the Auction market. Do I have lots of Omegas – no I don’t – Again I have one vintage model. What about Tag’s- no, and so on an on – you get my meaning? I buy what I like – period! But things change, perceptions change, new models come along – not actually new of course, though that’s not out of the question, but perhaps new to me. The more you see it and examine it – Hey this is a watch I want to own and wear. A fine example is my Gerald Genta Bartolomeo. I wanted a GG for years and there were so many that I liked, I always looked out for any Gerald Genta, as there was every chance I would love it anyway. then this auction comes along, a chance to buy it – and I did. I’m wearing it now as I do most nights . . . . . So maybe another couple of non-vintage models will have to go along with the two above, plus perhaps half a dozen vintage 1940’s era models will join them. Hopefully with the proceeds from the auction I can seek out new experiences and so the cycle begins again. Note – As I said before – if there are watches on the site that anyone is interested in buying – just let me know. If I still have it, then I’m always open to discussion. Or maybe I’ll say – no way, this is one of my “keepers” – but you never know. The latest Post features my Aeromatic A1408 “Observers” military style model, which although a great watch to wear, it’s luminous quality is a little disappointing. OK but disappointing. This is a pity as the apparent target market for this watch would as a body, see the importance of luminosity as desirable a feature. Now as I understand it, Radioluminescence is produced by nuclear radiation. Compounds such as zinc sulfide used to be in watch dials even before the 1920’s and in combination with a radioactive material such as thorium or radium-226, which emitted Gamma or alpha particles, excited the electrons in the zinc sulfide. With hands, numerals and dot markers painted with such compounds, this resulted in the dial emitting afterglow for a long time, but the underlying health dangers were simply not understood. This all changed with the realization that radiation could cause fatalities and research started on finding alternatives. The first safe substitute materials were introduced by the Japanese, called LumiNova and LumiBrite. These are much better than previous materials, though with the new visibility standard ISO 3157, they still don’t fully meet the minimum required. In the case of my Aeromatic watch I assume that Luminova may be the material used, as it has the similar afterglow of around 3 or 4 hours maximum of that particular compound. A newer product is Super-Luminova from Tritec (Swiss) with no radioactive components is certainly an improvement and manages an afterglow of up to 10 hours, though again like Luminova this fades. But an important point, certainly in comparison with Tritium, it has an unlimited lifetime and doesn’t wear out – in other words it will always have the ability once charged, to give it’s 10 hours of afterglow. But there’s no question that the real advance was and still is Tritium and whilst it is a radioactive isotope of hydrogen with an atomic mass of about 3, its good in that it emits Beta particles. And unlike Gamma, these are almost completely absorbed by the watch glass. In use the compound (a mix of tritium and a polymer ZnS) is further sealed inside tiny glass envelopes as an additional precaution. I say precaution, but even if both the glass phial and the watch glass were broken, the mount of Beta radiation is so negligible it is way, way below any possible health concerns. Just a break in my preamble – Lighting overkill? this Night Vision Victorinox has luminous dial features AND a rather exotic light – maybe this is an alternative way forward? As to the illumination or afterglow, there are always arguments re’ the comparison of Tritium and Luminova, though the tests are quite clear. At the start Luminova is brighter than Tritium, but it decays at an exponential rate and after around only 40 minutes it is not as bright as Tritium and after 3 to 6 hours it’s luminous intensity is very low (Super-Luminova 10 hours) whereas Tritium is exactly the same as it was at the start – it is virtually constant. Though that said, Tritium as a emitting source will actually start the process of decay after around 10 to 15 years. But of course the story doesn’t end there as there is much ongoing research, to find the compound that will give us a perpetual and permanent light source, which at the present time is not an option. As usual – it’s only a matter of time!